Now Recruiting for Neighborhood Harvest Leaders! On Saturday, February 22nd, GleanSLO presents the first bi-annual Neighborhood Harvest Leader training! We are looking for committed volunteers interested in taking on a leadership role within their communities to help expand the Neighborhood Harvesting program. Harvest Leaders will work closely with the GleanSLO staff to scout properties, schedule and lead neighborhood harvests and donate produce to local agencies in your area. What does it take to be a Neighborhood Harvest Leader? Shadow veteran volunteer or staff for two gleans prior to accepting Neighborhood Harvest Leader title. This entry was posted in Backyard Harvests, Events on 01/29/2014 by gleanslo. 10. GleanSLO creates community by bringing people together to share the abundance of San Luis Obispo County. 9. GleanSLO is committed to reducing local food waste. 8. GleanSLO provides an opportunity for the Food Bank, local farmers, distributors and consumers to work together in creative ways to improve our local food system. 7. Nearly half of the food distributed to the 44,000 hungry people in SLO County through the Food Bank is produce, a portion of that comes from GleanSLO’s efforts. 6. GleanSLO is helping to change our local food culture by inspiring all age groups to appreciate fresh, nutritious food and the journey from farm-to-fork. 5. Gleaning is good for farmers and homeowners, who are happy to see the fruits of their labors shared with those in need. They may also receive tax benefits because of their donation. 4. One third of low-income residents in SLO County eat produce less than once per day. GleanSLO improves the health of community members, such as children and seniors, who have difficulty accessing fresh fruits and vegetables. 3. Gleaning addresses food insecurity in a sustainable way. As a program of the Food Bank, GleanSLO stands out as an innovative model, both statewide and nationally. 2. GleanSLO rescued over 210,000 pounds of produce that would have otherwise gone to waste in 2013. 1. GleanSLO volunteers, homeowners, farmers, growers and consumers are working together to create a stronger social fabric to solve the deeper issues related to hunger. Join us for another FRUITFUL year in 2014! 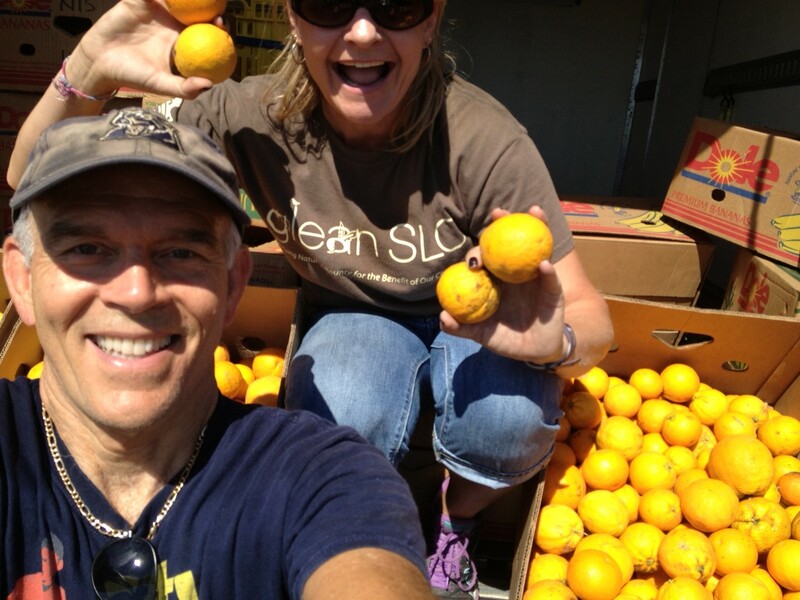 Chuck and Kelly, a couple of GleanSLO’s all-stars! 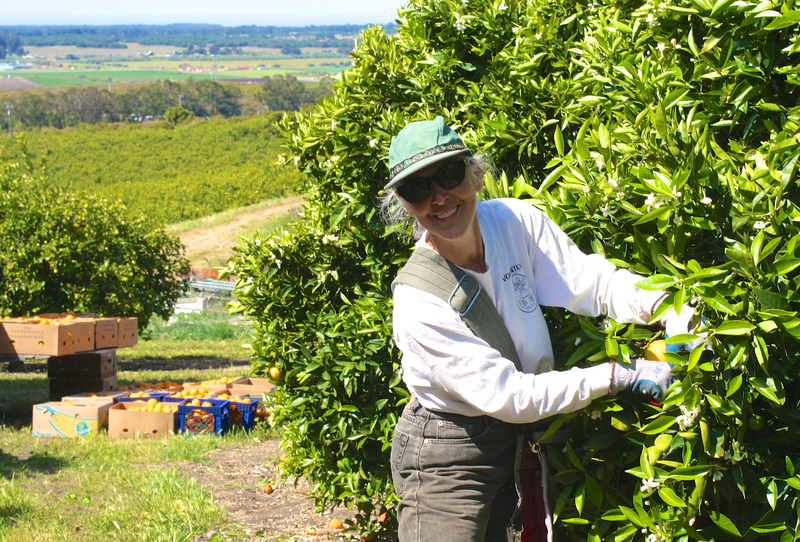 We’re ready to tackle citrus season next month! This entry was posted in Uncategorized on 01/15/2014 by gleanslo.